A shower or bath chair is just a chair- right? Well, not quite. At ORCA HealthCare we are committed to providing you with all the information you need to make an informed decision about your bathing requirements. 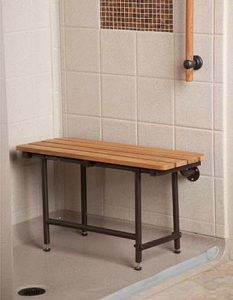 The first important thing about accessible bathing chairs is that they should always be fixed to the wall. Stand-alone chairs, often sold in medical supply stores, are flimsy, unstable and may even slip around on the floor of the shower. Seachrome offers some great shower seats that are safely secured to the wall and fold away easily. The SSB2-480240-PWS model even comes with swing-down legs and is available in a range of sizes. We recommend 18″x15″ and 22″x15″ for residential bathrooms, but we don’t mind if you choose white, teak or padded seats- that’s up to you! Another fantastic Seachrome model is the STPA-265150-PWS portable tub seat, which has adjustable feet to make sure you have a sturdy level surface no matter what size or depth of bath you have. To add a little style to your safety, we think you really can’t go past the Invisia Bath Bench. With its Brazilian Walnut finish, this bath bench not only looks spectacular, but is three times stronger than teak wood and resistant to moisture and mildew. 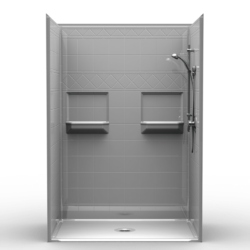 Take a look at how this beautiful model can be incorporated into a relaxing and luxurious bath on the Invisia website. 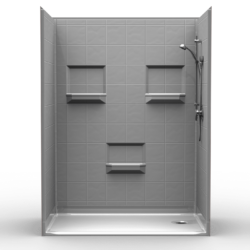 You can also click this link to see our full range of accessible shower and bath seating from ORCA HealthCare.